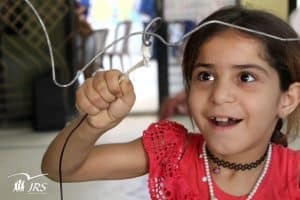 Dunia Saad, Regional Communications Officer for Jesuit Refugee Service in the Middle East, wrote the following article for CJI’s Bridging Borders campaign. It first appeared on the igNation website on 14 November 2018. The Jesuit Refugee Service (JRS) has been responding to the emergency crisis in Syria since 2011, witnessing firsthand the extent of the suffering of the forcibly displaced community. The destitute conditions these communities were forcibly placed in can never be illustrated in major media headlines, nor in the best of articles. “Displacement is not an adequate word for the suffering we have endured,“ says Noura, forcibly displaced and now resettled in rural Damascus. The JRS community centre in Jaramana, in the greater Damascus metropolitan area, is one such bridge and it is actually more than the name community centre implies. It is for some children where they clutched and felt a pencil in their hands for the very first time. For others it is the sheer joy of practising their basic right to hold that pencil again. And for all children it is a safety zone, a place where they can reconnect to a sense of belonging and constancy that the war tore away from them. “My dream came true when I enrolled at the JRS Community Centre,” says Ahmad, 13 years old, forcibly displaced from Der-Ezzor.